The best-selling musician, who has been called "the prince of romance", performed for the Galapagos tortoises at ZSL London Zoo in the build-up to Valentine's Day. 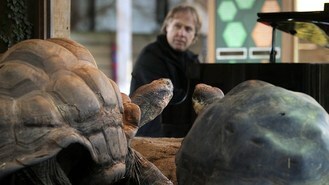 French star Richard, who is staging a recording comeback after more than a decade, played a selection of seductive tunes on a grand piano at their enclosure in a bid to encourage the reptiles to stage a performance of their own. The pianist was playing to Dirk - who is thought to be more than 70 - and his younger female companions Dolly, Priscilla and Polly, all 17, and 13-year-old Dolores. According to the Motown hit, You Can't Hurry Love, but Richard was hoping to speed things up in the sedately paced tortoise world to spark their animal instincts and bolster the species. Richard said: "Music is a powerful thing, and I would like to believe it has a positive effect on animals, as well as us. It certainly is an experience to play in such a well known and romantic place as London Zoo." The 59-year-old keyboardist, who released his new album Romantique this week on Decca Records, had not visited the zoo before his show. Richard became a huge star in the late 1970s thanks to his track Ballade Pour Adeline, which is one of the biggest-selling recordings of all time. Scientists have suggested that music can affect animal behaviour and some farmers have claimed classical tunes helped to increase the yield of milk and eggs in their livestock.